BITS Pilani Recruitment 2019 - Job notification for JRF Post on a project entitled "Design, Synthesis, Biological Evaluation and Molecular Modelling Studies of Indolyl Oxoacetamide Quinazolinone Based Hybrid Analogs as Potential Pancreatic Lipase Inhibitors for Obesity Treatment" in Department of Pharmacy, BITS Pilani, Rajasthan. Applications are invited by Birla Institute of Technology and Science (BITS), Pilani on or before 20 Apr 2019 and Interview held on 1st week of May 2019 for 1 vacancy. 1 M. Pharm/ M.S. (Pharm.) in Medicinal Chemistry/ Pharmaceutical Chemistry/Natural Products with GATE/GPAT/CSIR-NET or equivalent examination. "Design, Synthesis, Biological Evaluation and Molecular Modelling Studies of Indolyl Oxoacetamide Quinazolinone Based Hybrid Analogs as Potential Pancreatic Lipase Inhibitors for Obesity Treatment"
BITS Pilani Recruitment 2019 - Job notification for JRF Post on a project entitled "Study of specific excipients for various pharmaceutical applications" in Department of Pharmacy, BITS Pilani, Jaipur, Rajasthan. 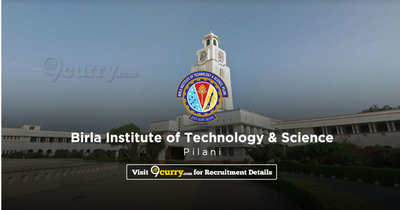 Applications are invited by Birla Institute of Technology and Science (BITS), Pilani on or before 28 Apr 2019 and Interview held on 1st week of May 2019 for 1 vacancy. BITS Pilani Recruitment 2019 - Job notification for JRF Post on a project entitled"Investigation of Elastic and Inelastic Dephasing in Carbon Nanotube FET" in BITS Pilani, Rajasthan. 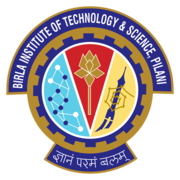 Applications are invited by Birla Institute of Technology and Science (BITS), Pilani on or before 30 Apr 2019 for 1 vacancy. BITS Pilani Recruitment 2019 - Job notification for JRF Post on a project entitled "Investigation on Langmuir-Blodgett films of pristine and functionalized single walled carbon nanotubes and application" in Head of Departmen, BITS Pilani, Jaipur, Rajasthan. Applications are invited by BITS Pilani on or before 22 Apr 2019 for 1 vacancy. BITS Pilani Recruitment 2019 - Job notification for JRF Post on a project entitled "Resource dimensioning and management of smart and sustainable 5G small cells for rural broadband" in Department of Electrical and Electronics Engineering, BITS Pilani, Jaipur, Rajasthan. Applications are invited by BITS Pilani on or before 30 Apr 2019 for 1 vacancy.